Some key sources of web accessible distribution data are listed below with a brief description of the scope of the data and how to access them. Note that the distribution data available via these sources are not necessarily 100 percent reliable as they are based on a variety of sources of recorded occurrences. Some of the sources may be out of date or otherwise unreliable (e.g., lacking coordinates or detailed location data, or taxa may have been misidentified). Occurrence records can only be verified by carrying out field visits. Also note that occurrence records obtained from more than one information source may lead to some records being duplicated. Therefore, the data must be carefully checked and 'cleaned' to remove any duplicate records. CWRIS is a searchable database of crop species and their wild relatives and an information portal, currently providing access to data related to taxa in the Crop Wild Relative Catalogue for Europe and the Mediterranean. 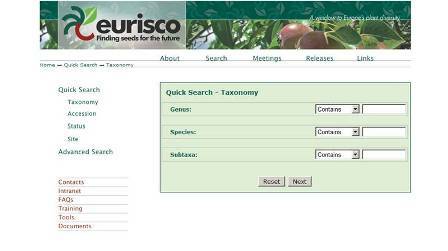 The taxonomic back-bone to the Catalogue was provided by Euro+Med PlantBase (http://www.emplantbase.org/home.html) version August 2005*. The Catalogue provides occurrence records according to geographic boundaries, not political boundaries. Therefore, in cases where a country comprises more than one distinct geographical boundary (e.g., Turkey and Turkey-in-Europe), the taxon records are associated with each geographical unit individually. Other examples include islands such as the Azores and Madeira (Portugal), and the Canary Islands (Spain)—each island in these groups has a separate entry in the database. See http://www.pgrforum.org/CWRIS.htm for further information about CWRIS and the Crop Wild Relative Catalogue for Europe and the Mediterranean. *Note that as of October 2009 (updated February 2011), revised taxonomic and distribution data for most families contained in Euro+Med PlantBase are now available directly from: http://ww2.bgbm.org/EuroPlusMed/query.asp. 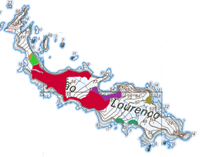 For the families that have been updated, it is recommended that data are checked directly from this source as the CWR Catalogue for Europe and the Mediterranean available via CWRIS has not yet been updated with the revised data set. GRIN taxonomic data provide the structure and nomenclature for accessions of the National Plant Germplasm System (NPGS), part of the National Genetic Resources Program (NGRP) of the United States Department of Agriculture's (USDA's) Agricultural Research Service (ARS). In GRIN Taxonomy for Plants, all families and genera of vascular plants and over 40,000 species from throughout the world are represented, especially economic plants and their relatives. Information on scientific and common names, classification, distribution, references and economic impacts are provided. GRIN lists the countries and subnational units (where applicable) for which taxon occurrence records exist. The records are grouped into areas and regions in accordance with the standard publication World Geographical Scheme for Recording Plant Distributions (Hollis and Brummitt, 1992), which divides the terrestrial world into nine areas: Africa, Antarctic, Asia-Temperate, Asia-Tropical, Australasia, Europe, Northern America, Pacific, and Southern America. Onine searches: To access distribution data via GRIN, click on the 'queries' link in the menu bar to search for information on your taxon of interest. If you want to restrict your search to a specific region or country, use the 'advanced queries – species data, multiple criteria' option. For example, to find taxa within the genus Beta that are native to Europe, enter 'Beta' in 'genus or species name' and select 'continent': 'Europe'. See http://eunis.eea.europa.eu/about.jsp for further information on EUNIS. 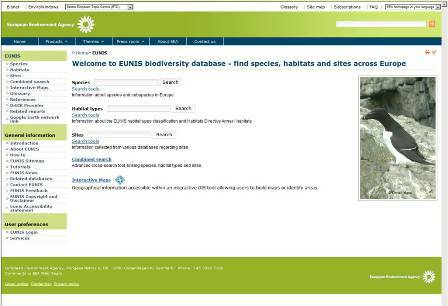 The BioCASE Portal provides access to the European biodiversity data in the GBIF system. It is complementary to the GBIF portal in that it provides more detailed information about specimen and observation data, especially when these are based on the rich ABCD standard. 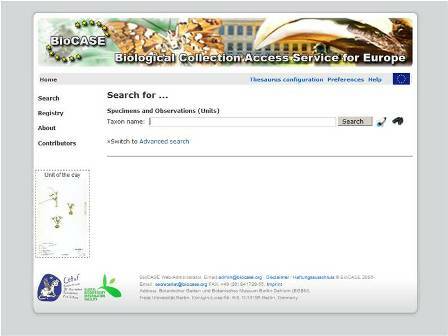 For European occurrence data, it is therefore worth searching BioCASE as well as GBIF. However, note that BioCASE is not as user-friendly as GBIF; for example, a search for a species name may result in multiple records, but when looking at the details of each record, you may find that you are looking at records for a subspecific taxon, not the species itself. The system may also return erroneous data when requesting file downloads. Data also vary greatly in quality, but this is most likely a problem related to the management of individual collections, rather than the BioCASE Portal. EURISCO provides access to passport data associated with PGR accessions held in ex situ collections in Europe (the data are not limited to taxa that occur in Europe, only those held in European collections). Note that much of the data you will find in EURISCO are accessible via GBIF. To find out whether a national database is available for the country of interest, use an internet search engine (e.g., Google), contact the country's PGR National Focal Point, or consult major botanic gardens and herbaria. In addition to the online data sources listed above, further distribution data may be obtained from Floras, monographs, journal articles, academic texts, grey literature and offline databases. Online library databases can be searched to obtain a list of published literature. Specialist libraries can also be consulted, such as those housed in gene banks, botanic gardens and other research institutes. Taxon specialists, conservation agencies and protected area managers may be able to provide access to information contained in unpublished reports and databases and/or personal knowledge about the distribution of taxa. Data collated from online sources and printed literature may also need to be supplemented with visits to herbaria to collate passport data directly from herbarium specimens. This is necessary for collections that are not digitized and not available online. Gene bank passport data may also be accessed by making direct contact with the gene bank manager.